Borough of Poole: Pure Town Planning have recently secured planning permission for a lovely elderly couple to enclose a patio on their large three bedroom ground floor flat in prestigious Canford Cliffs village, Poole. The existing patio to the master bedroom was enclosed by a quite harsh looking white painted metal railings. It transpired that this part of the flat received the evening sun but currently wasn’t arranged to take advantage of it. 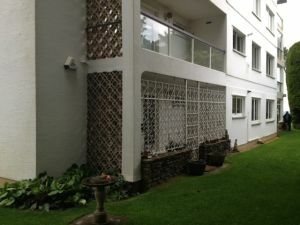 Therefore our clients simply want to make better use of this part of the flat by replacing the existing railings with windows and glazed sliding door, turning it into a sun room. For most dwellings such an alteration would usually fall under Permitted Development Rights, however flats do not receive permitted development rights and as such formal consent was required. Despite a number of objections from other residents in the block who felt that the proposal would be at odds with the character of the building, planning permission was granted first time, well within the 8 week time frame. Our client who had just celebrated his 90th birthday the day before the decision was delighted, declaring that “this is the best birthday present so far!” . If you are planning a small alteration/extension to your property or even a larger one… and would like someone to prepare, submit and manage the whole process for you, leaving you stress free, then why not give us a call today on 01202 585524 or email info@puretownplanning.co.uk and find out how we can help you.